Nerves of the autonomic nervous system, with splanchnic nerves seen in center. 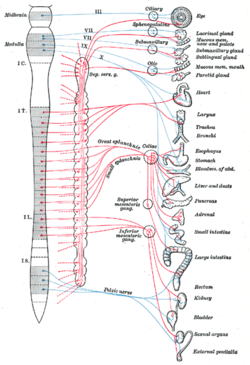 The splanchnic nerves are paired visceral nerves (nerves that contribute to the innervation of the internal organs), carrying fibers of the autonomic nervous system (visceral efferent fibers) as well as sensory fibers from the organs (visceral afferent fibers). All carry sympathetic fibers except for the pelvic splanchnic nerves, which carry parasympathetic fibers. This page was last edited on 12 February 2018, at 00:28 (UTC).